Note: A chronology of our delegation activities is found at the end of this report. 	Visiting with friends in Managua: Nan McCurdy, Paul Baker-Hernandez. – Meet with as many individuals and families as we can, getting their stories and photos and videos for future news articles, website, fundraising appeals, etc. – Meet with Nora and Alba Mara re: project for girls and women at risk. Evaluate whether the program is working so far. What do they see as next steps? Revolving loan fund: We met with a number of loan beneficiaries who have borrowed repeatedly from the fund over the last 8-11 years, and have gradually increased the amount of their loans. They really like the program and expressed their appreciation for it. They would like to see (1) an increase in the maximum permissible loan for longtime borrowers; (2) a reduction in the interest rate for longtime borrowers if possible, while acknowledging that our fund charges the lowest interest in the area; (3) an increase in the fund principal, so that even more people can benefit. We explained that the first two points are under the administration of the Limay committee, based on their administrative costs and sustainability of the fund; and that we in Baltimore would do our best to address the third point by raising more money for the fund. Latrines: This project, which constructed 30 new latrines during 2008, went uneventfully and well. Leonidas purchased the materials, and Tranquilino supervised the construction, with manual labor provided when possible by the beneficiaries themselves. We will seek additional funding for more latrines in 2009. CENIC Child Care Center: Limay’s outgoing mayor, Maria Gilma Rosales, succeeded in getting lots of good equipment and materials for the CENIC from an organization in Spain – freezer, refrigerator, microwave, food processor, juicer, tables and chairs, playground equipment, etc. They need almost nothing now, except for a kitchen fan and some children’s DVDs for their new DVD players. But they can’t install the equipment until they revamp their electrical system, which will cost roughly $325. Edwin Castellon said the L’Esquirol/Limay sister city doesn’t have the funds for this; I committed Casa Baltimore/Limay to covering this expense. Scholarships: It was really gratifying to meet with most of the 17 current scholarship recipients, and one recent graduate. They are bright and eager to improve their lives and the life of Limay, and they expressed their gratitude for the opportunity they’ve been given. They had two suggestions for this program: (1) Could we possibly increase the number of scholarships, so that more people can benefit? (2) Is there any chance of having their own school bus? When so many students ride the bus on Saturday, it’s overcrowded – and recently there was another bad accident that killed one young man and badly injured another. They were interested to hear more about the ways we work to raise money for the program. They showed special interest in the upcoming “Fiesta Tropical,” asking us what kinds of Nicaraguan food we would serve! I wished I could “beam up” one young woman to Baltimore for the event, as she has excellent culinary skills! After our formal meeting, we treated them to sodas and fruit juice at a nearby establishment, Mi Rancho. They’re a friendly bunch! One young man composed a song for us, which he performed at our good-by party. We have video footage of this available, along with a translation of the words. I was personally approached, during our week there, by three different people asking for scholarships. Two students graduated this past year. One of them is still living in Limay and is unemployed. She’s hoping the committee might spring for a bit more scholarship money so she can develop her computer skills and become more employable. The second student is now working for the Nicaragua Embassy in Costa Rica. Feeding the elderly: It’s clear that this program is in very great demand. All you have to do is see how people gather and wait for their packets. We participated in preparing the packets and in handing them out, so we interacted with people firsthand. And we have photos we can share. Enough said. Pilot program with girls at risk: About 13-17 girls aged 10-16 have been attending twice-weekly sessions, which include discussion with Alba Mara Maldonado, an educator and psychologist, and hands-on crafts-making (pi~natas and envelopes) with Amparo Betanco, who has been working personally for some time with girls at risk in Limay. They are having to tread carefully, as some parents are reluctant to let their daughters participate, because sexuality is included among the discussion topics. Alba Mara held a special meeting with Rio Abajo parents during the week we were there, to hold an open dialogue about the project. Alba Mara was about to end her time working with the project, because she was heading for a semester’s study in Spain beginning January 20. A psychologist from Esteli, Lidia Amanda Mesa, was to continue the work to the end of the 10-week project. Titles to land: There is a big push now across Nicaragua to help people gain titles to the land they have been living on. The program, called INIFOM, began under President Bola~nos, but it has picked up speed under President Ortega. Edwin Martinez Corea (Olidia’s son) is the local lawyer working for INIFOM. He believes the land title work in Limay should be largely finished in 12-18 months. The work across Nicaragua may continue into the next administration. Edwin helps people find out whether there’s any counter claim on their land, or whether someone else already has title. If not, they can move ahead easily to obtain title. Edwin also told us that many people in Limay don’t even have cedulas (national IDs), so they need to get these now. Many people don’t even register the births of their children, so it’s hard to prove they’re legally Nicaraguan. We asked Edwin about the process for an organization’s becoming a persona juridica (legal organizational entity). He said there are two types of persona juridica. One is called an asociacion sin fines de lucro. The second is called fundacion. A fundacion has fewer stringent requirements. Edwin later provided me with a copy of the section of Nicaraguan law pertaining to this. Politics in Limay: The new mayor, Juan Ramon Mendoza, has taken office in Limay. When we were there, outgoing mayor Gilma Rosales was finishing out her last couple of weeks of work. Gilma expressed satisfaction with her achievements over the last 4 years, although she wishes she could have done more, given greater resources. The central government has approved two bridges in the municipality, for the villages of La Naranja and Tranqueras. A university in Madrid donated money for a large Casa de Cultura which is under construction right now; this will be used for teaching cultural traditions and for cultural events. An association of local authorities in Zaragosa, Spain, donated money for playground equipment and educational materials at the CENIC. San Luis, Pedernal, and Las Brisas (?) recently got electricity. We met Juan Ramon Mendoza informally and briefly; he seems very nice and exceedingly eager to work hard on behalf of Limay. The Limay committee, and decisions made: After much discussion, here are some of the decisions we arrived at, as I understand them. They agreed to develop a plan for the animals project as quickly as possible. About half the $15,000 donation will be used for cows, and the other half for chickens, with a small amount for beehives. They all agreed that training and follow-up are necessary components of any such project. They agreed to pursue official NGO status, i.e., persona juridica, as the government is urging all groups to do this. The national scene: This is extremely hard to assess, given only two weeks in the country and only two days meeting with national-level officials through the Nicanet delegation. It’s messy. The country is polarized politically, and the division seems largely class-based. Most poor people appear to favor the current FSLN administration, and its attempts to help them through new programs like Zero Hunger and Zero Usury, and the huge improvements in educational and healthcare access. There is much to recommend the current administration, especially when we remember the travesties on the poor committed by the past three. But there are other issues operating also: Some people, especially those active in women’s networks, perceive that the Ortega administrative has been vindictive in its treatment of them because of their support of Ortega’s stepdaughter. (The stepdaughter had accused Ortega of longstanding sexual abuse during her youth, although she has since dropped any pursuit of charges.) The finances of women’s groups have been closely investigated by the government, allegedly because they often don’t have NGO legal status. The FSLN government has accused women’s groups, along with other groups like Oxfam, of funneling international funds into the country in order to destabilize the current government. Of course, since the US and some other countries have used funds to destabilize Nicaragua, it’s possible that the government is right! The FSLN has greatly increased its control over local municipalities, given their electoral sweep in the November 2008 municipal elections. In Limay, I heard no claims that the elections were fraudulent; a new FSLN mayor has replaced the former FSLN mayor. But loud cries of “Foul!” have been heard in numerous other municipalities. The problem is, the claims have been made in the mostly-rightwing press, rather than being taken to the Supreme Electoral Council which adjudicates such claims. So it’s very hard to assess their merits. I haven’t mentioned yet that many people are disturbed by the “pact” between the FSLN and the rightwing Constitutional Liberal Party of Arnoldo Aleman (who stole the country blind during his Presidency). The purpose of the pact is alleged to be Daniel Ortega’s immunity from prosecution on the sexual abuse charges I mentioned earlier. Finally, some people, who otherwise support FSLN policies, just wish Daniel Ortega would tone down his rhetoric. They would like him not to go out of his way to alienate powerful entities like the US. 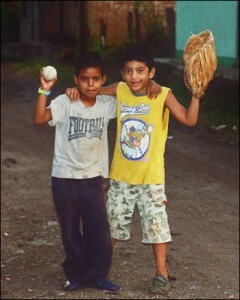 Thursday, Jan. 1: Traveled from Baltimore to Managua. As agreed, met Paul and Theo Pojman, Baltimoreans, in the Managua airport and headed together for an overnight at Quaker House. Friday, Jan. 2: In the morning, the three of us left Paul and Theo behind. We took the express bus to Esteli, where we met Kerri Dougherty (sophomore at MICA) and traveled together to Limay. After a brief meeting with the Limay committee, we ate and fell asleep, tired. Saturday, Jan. 3: The four of us visited the Institute mural (Kerri had worked on this last June, in the MICA community arts program, with a group of Institute students). This was followed by visits to several loan fund beneficiaries: Edith Perez’s home and store, the bakery (run by husband Reynaldo Gonzalez Blandon and wife Aleyda Cruz Hernandez), Oscar Davila’s marmolina workshop, and another family (husband Juanerge Altamirano, wife Erlinda Blandon, daughter Marbely Altamirano) working in marmolina. We also visited with wife Transito Calderon and husband Francisco Castellon Hurtado, who gave us some history of the 1980s in Limay, when Nan and Phil were there. Paul and Theo arrived mid-afternoon and joined us for the last visit. Sunday, Jan. 4: Claudette and I attended mass while the other four walked to Rio Abajo (El Calero) and bought some ceramics. Then all six of us visited the bicycle shop operated by Mauricio Acevedo, a loan fund beneficiary. At that point, three Baltimoreans left us – Kerri, Paul, and Theo – to study Spanish in Esteli during the following week. Claudette and I visited with Gilma Rosales, mayor. Then all three of us met at length with the Limay committee, in the first of three meetings during our week together. We also met with Leonardo Silva for a time. Then the three of us had a long discussion about the Limay committee and our relationship with them. I then moved to Gilma Rosales and Antonio Vindell’s house, where I slept for the rest of the week; Claudette and Brandi remained at the Casa Baltimore. Gilma and I had the first of two long discussions. Monday, Jan. 5: We visited more loan fund beneficiaries: Hugo Aguirre Mairena, a marmolina sculptor; and Ramona Lopez, a butcher, sausage maker, and marmolina sculptor along with her compa~nero Pedro Antonio Aguilera. We met with Edwin Martinez Corea briefly and learned a bit about his work with INIFOM, to help people get titles to their land. Then we visited with an elderly woman, Lucila Quiroso, who gets monthly food packets. We visited the CENIC and conversed with Alba Xiomara Morazan, director. After lunch, a nap, and email at a local cybercafé, we met with two representatives of the local literacy program, Eddi Calderon and Heidi Alfaro, who provided a written report on their program as well as how they had distributed our donated eyeglasses. After dinner, I met with Nidia about her family and financial situation. Then we all met with Nora Lavadie, Alba Mara Maldonado and Amparo Betanco about the pilot project for girls. I later had a talk with Antonio about road proposals for northern Nicaragua and other topics. Tuesday, Jan. 6: Meeting with Elvin Castellon (director), Leonardo Silva (staff technical worker), and Miguel ___ (board member) of FEDICAMP; they had truck trouble, so the meeting was twice-rescheduled and finally started right before lunch. Laundry, lunch, siesta, cybercafé. Second lengthy meeting with Limay committee. Joined at dinner Edwin Martinez Corea, who described his land title work in more detail, and also gave us information about two types of NGO status in Nicaraguan law. I had a long talk with Gilma Rosales in the evening. Wednesday, Jan. 7: We all joined three members of the Limay committee and Margarita in packing food for the elderly, 190 bags in all. Then we three joined Gilma and Antonio at their farm, Tierras Blancas, where we spent much of the afternoon. We then met with nearly all the scholarship students, followed by our treating them to beverages at Mi Rancho. I fell asleep immediately afternoon and didn’t awake till morning – the closest I ever came to feeling unwell on the entire trip. Thursday, Jan. 8: We joined the Limay committee and Margarita in handout of the food packets to the elderly. Then Claudette and I walked to Rio Abajo (El Calero) and bought more ceramics. After lunch, we all cleaned the Casa Baltimore (along with Tranquilino, and Reyna Corea for a time) in preparation for our good-by party in the evening. We held our third lengthy meeting with the Limay committee, followed by a terrific party. Friday, Jan. 9: Early a.m. journaling, followed by Quick trip to the cybercafé. Deliveries of marmolina orders arrived. All of us packed marmolina and bags, and Tranquilino and Ramona Lopez helped us wrap the marmolina. Many heartfelt good-bys with people. Bus to Esteli, followed by immediate express to Managua. Taxi to Quaker House, learned they had no room; as we were dealing with this situation, two of their guests were robbed at knifepoint just down the street. We took another taxi to the Backpacker Inn in the center of town and took it easy the rest of the evening (Chinese dinner, cable TV, hammocks). Saturday, Jan. 10: I made my first of two trips to an English-speaking dentist, to get an inexpensive dental crown. We arranged to store our bags at the Backpacker Inn for a small fee, and took off on the bus for an overnight at the beach in Pochomil. Hellish bus ride, lovely evening at the beach, dinner, full moon. Over dinner, and over our meals the following day, we bought lots of shell- and seed-based jewelry and decorations for our Feb. 7 fiesta. Sunday, Jan. 11: More fun at the beach, followed by a noonish bus ride back to Managua. After retrieving our bags, we joined the Nicanet delegation for a dinner and evening gathering with Managua English speakers. Monday, Jan. 12: First day with Nicanet delegation, consisting of four meetings. When I get my notes back from Kathy Hoyt, I can share more about these. We met with two local teachers, and also with a group called Nicarao Coop, which funnels Venezuelan money into agriculture projects. We visited a Managua health clinic and heard from the head of MRS (Movimiento Renovacion Sandinista, the other Sandinista group, formerly a political party). Tuesday, Jan. 13: Second day with Nicanet delegation, consisting of four more meetings. We heard from two social and economic analysts/ critics, we visited the national Minister of Education, and we had a presentation from an internationally known grassroots health advocate. After dinner, we left the delegation and bedded down at Quaker House. Wednesday, Jan. 14: Spent all morning, lunch period, and early afternoon shopping for crafts at Huembes. I then had my second dental appointment, getting my crown installed. In the evening, we met Nan McCurdy, Miguel Mairena, and Paul Baker Hernandez for dinner and conversation. We then packed our bags into the wee hours. Thursday, Jan. 15: Traveled from Managua to Baltimore.